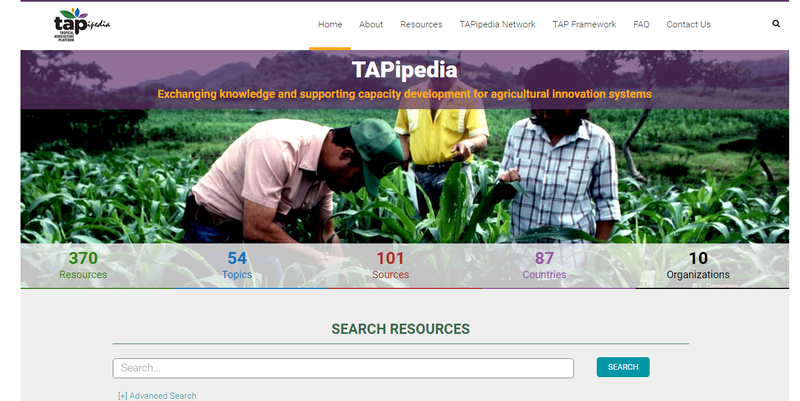 TAPipedia (http://tapipedia.org/), developed within the framework of Tropical Agriculture Platform (TAP), is an information sharing system designed to enhance knowledge exchange in support of Capacity Development (CD) for Agricultural Innovation Systems (AIS). TAPipedia aims to be a global information system for good CD practices, innovation outputs, success stories and lesson learned. TAPipedia allows TAP partners and other stakeholders to share their own context specific CD for AIS resources documenting their related work and experiences and to discover such knowledge from different sources and partners. Ultimately, TAPipedia puts focus on sharing resources on facilitation, learning, documentation and knowledge management to enable agricultural innovation. Within this context, the development of the TAPipedia taxonomy has been a particularly important process. Based on the review of CD for AIS resources completed by the TAP CD Expert group in 2015, the TAP Secretariat developed an initial list of more than 80 terms, and checked the matching and/or related terms in the AGROVOC thesaurus, in view to link the TAPipedia taxonomy terms to concepts in AGROVOC. The link to AGROVOC is important to improve the discoverability of resources in TAPipedia and, more generally, to comply with AGROVOC as a standard thesaurus for professionals in the field of agriculture. In a next step, in order to have a more concise and accurate list of terms specifically relevant to CD for AIS, the TAP Secretariat narrowed down the terms by half and shared them with TAP Partner experts, requesting to review and suggest additional terms they found should be added. TAP Partners enthusiastically engaged, reviewed, provided feedback and suggested additional terms. The feedback and suggestions were discussed by staff of the TAP Secretariat, and considered or integrated in the TAPipedia taxonomy. The TAPipedia taxonomy includes 54 terms, which are also referred to as “topics” and “tags”. These terms allow to filter and to categorize TAPipedia resources according to the most important aspects and dimensions related to CD for AIS. For example among the proposed terms those terms which are considered core issues for TAPipedia have been privileged, such as “participatory processes” and “facilitation”. Terms of the TAPipedia taxonomy which are not present in the AGROVOC vocabulary have been proposed to the AGROVOC team and are currently under their review. The TAPipedia taxonomy is the result of a participatory process engaging TAP Partners’ experts, and not regarded as final but as work in progress. The TAP Secretariat monitors the use and feedback on TAPipedia terms, and analyzes them for an update of the taxonomy at a later stage to ensure a relevant taxonomy that captures well lessons learned, further experiences, learning and development of new concepts on CD for AIS. According to the definition of the Dublin Core Metadata initiative and to ISO25964-2:2013, a taxonomy is a “scheme of categories and subcategories that can be used to sort and otherwise organize items of knowledge or information” (http://wiki.dublincore.org/index.php/NKOS_Vocabularies#KOS_Types_Vocabulary). It is therefore an essential instrument to organize and share knowledge according to an agreed categorization.